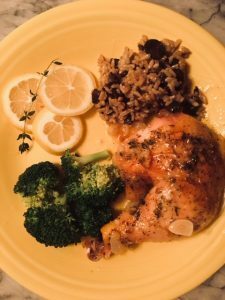 Chicken is one of the most popular food choices, especially when we are trying to cook healthy. You can never have enough chicken recipes! 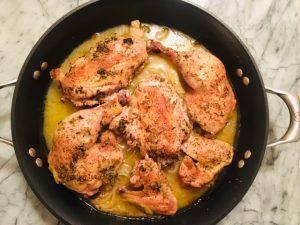 This Skillet Roasted Lemon Chicken by Ina Garten is AMAZING!! You will savor every bite of this melt in your mouth goodness. This wins the title “Recipe of the Year” at our house. It is that good. Best of all, you can cook it all in one pot and it tastes just as good for leftovers the next day. Pour olive oil in a small measuring cup, stir in the ground herbs and spices and set aside. Evenly distribute the lemon slices across the bottom of a 12″ ovenproof skillet and then distribute the onions and garlic on top. Place the chicken, skin side down, on top of the onion and brush with half the oil and herb mixture. Turn the chicken skin side up, pat dry with paper towels (DO NOT skip this step!) and brush all over with the remaining oil and herb mixture. Roast another 10-15 minutes, until a meat thermometer inserted in the the thickest part of the breast registers 155-160 degrees. Cut the chicken into quarters or eighths and serve with the hot pan juice, cooked lemon, and onion. NOTE: The cooking pan used in this recipe is the Calphalon Unison Non-Stick 12″ Covered Everyday Pan. This pan is a workhorse and is used almost daily at our house. You can seamlessly move from stovetop to oven with this pan and it cleans up quick and easy. **NOTE: When you have the time, enjoy the pleasing aromas of the essential oils released from the leaves of fresh herbs when you grind them in the mortar and pestle. The experience of hand grinding the spices can also be relaxing and it is an uplifting reminder that preparing healthy foods for friends and loved ones can be a gift to them.